RP1001PB is rated 4.5 out of 5 by 71. Rated 5 out of 5 by netshopper from Does the job well Works well, looks good, seems durable. The included funnel for filling is a nice bonus. Rated 3 out of 5 by Fairportis from Matches the faucet but it's flimsy Bought this along with the top of the line Trimsic Pro faucet. It was the only soap dispenser that matched in color (black stainless). The color and style do indeed match but we find it's operation flimsy. It has a long soap dispensing spout and a small button on top. (My kids think it looks like a tank barrel!) Unfortunately, If you do not push directly on top of the center button of the dispenser it almost comes apart at the head. And it's very hard if you have a sponge in your hand and you try to dispense soap at the same time. It's awkward and many times I end up having the dispenser start to come apart. overall, we can not recommend this design and would have returned it if there was another option from Delta in the color/style we need. 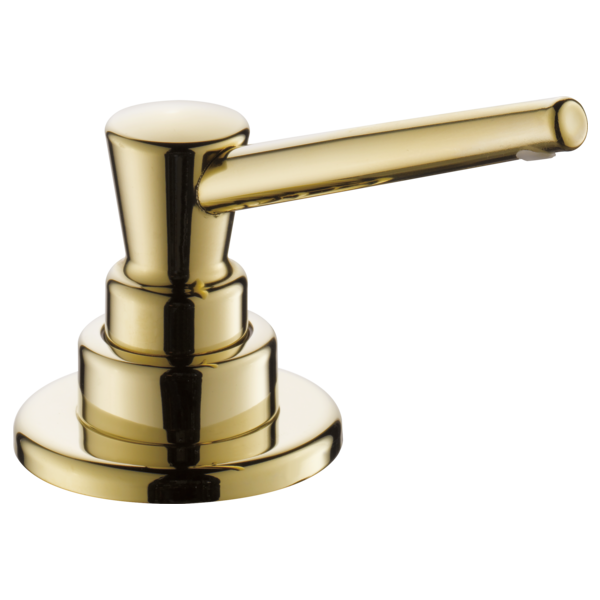 Rated 5 out of 5 by iskinny84 from Perfect accent to our existing faucet! We also ran a hose from the dispenser down to a large container of soap, instead of filling the small bottle, and it’s great for less refills! Rated 4 out of 5 by ToolKing from Satisfied with product This item was described accurately on the web description. I'm happy with the quality and the installation instructions were easy to follow. Rated 5 out of 5 by Sran from Easy to use & refill. Easy to use & refill looks good and looks sturdy.Love the classic simple lines. Don't need anything ornate and it goes with the decor of the remodel beautifully. Rated 5 out of 5 by Jim74 from Love the Funnel What a great touch for a great product. I've had a soap dispenser in the kitchen sink counter forever. I had new quartz counters made and thought before they are installed I'd do new accessories. Delta was my choice. The previous dispenser was always difficult to fill because I never thought to use a funnel. Now is so simple to do my wife can do it. Thanks for a great idea for a great product. Does the black of this dispenser exactly match the matte black faucets such as the Delta-Essa-Touch2O? Is this or any other of your manual soap dispensers ADA compliant? Can this dispenser use foam soap? Hi, Your website page says this holds 13 ounces, but the tech spec page says 10 ounces. Whish is correct? Product Features	For use as soap or lotion dispenser Large capacity 13-ounce bottle Refillable from above the deck Includes refill funnel _ STANDARD SPECIFICATIONS: &bull; 10 ounce bottle. &bull; Refillable from above the deck. &bull; 1 1/4&quot; max. deck thickness. &bull; Order RP31845, for extended mounting nut. Allows for 2 1/2&quot; max. deck thickness. &bull; Includes RP30395 refill funnel. &bull; Mounts in standard hole sizes 1 1/4&quot; - 1 1/2&quot;. What is the hole cutout size for RP1002 soap dispenser? Do you make a dispenser for FOAM soap? I have several but they are for liquid soap. Hello Ronald, Thanks for your question! Unfortunately, we do not currently make a soap dispenser that will work properly with foaming soaps. I hope this helps!